When I post some old piece of art because I’m too busy to post something good, it probably feels like I’m punishing you, Dear Reader,. I apologize for these terrible artifacts that I inflict upon you from time to time, but please understand that the person who’s truly being punished is me. My crimes: Poor planning resulting in a sub-standard post and drawing poorly “back in the day.” For the latter crime, there is no statute of limitations. The sentence: My crude scrawlings from 13 years ago will be posted here, to be seen and derided until the internet falls into ruin. This is some fan-art of Chichiri and Tasuki, two cool characters from a generally mediocre and melodramatic anime, Fushigi Yugi. Actually, all the characters in that series were cool, except for… oh you know, like, the MAIN four characters. But I digress. 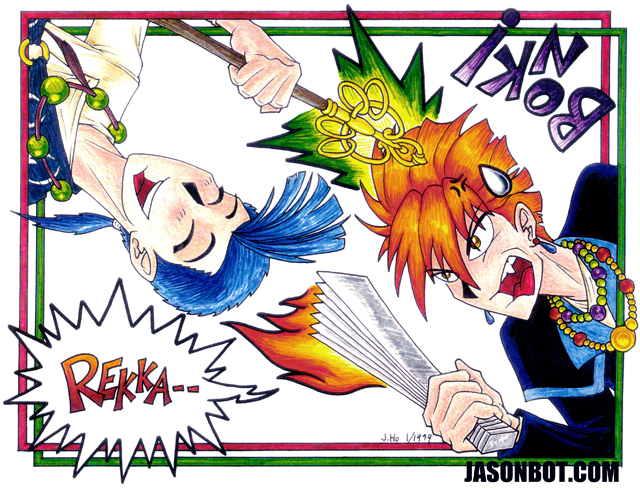 I’m really not proud of this–the only thing I can say in my defense is that that this was drawn as an in-joke, because Fushigi Yugi was the one terrible anime series that we had to sit through at an otherwise excellently programmed anime club back in ye olde college dayes. Of course I can’t explain why I don’t have any fan art pertaining to the numerous good anime that we watched (Gundam Wing, Evangelion, YuYu Hakusho, Escaflowne, Macross plus, etcetera).